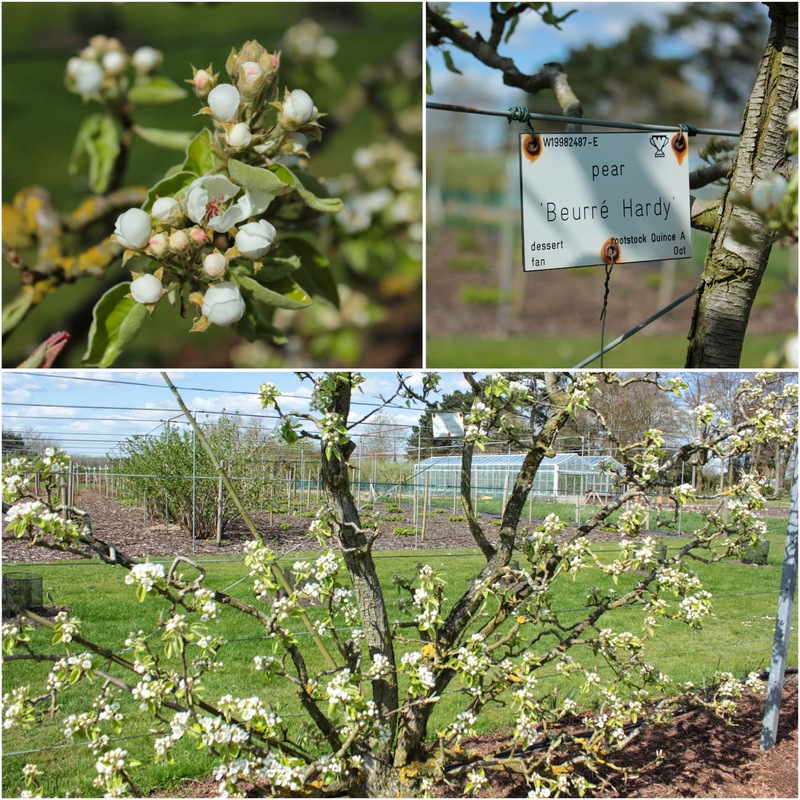 As Chief (some might say 'only') Grower in the food garden here, I enjoy an opportunity to see what other people are up to, so it was with a happy heart that I went to have a good nosey around the orchards and trial grounds at RHS Wisley. Here's what I found. Harking back to my perennial fascination with the art of pruning, I couldn't help but notice the way the apple trees have been shaped over the years. Look at the way whole branches have been pruned off these trees, leaving the centres open for ventilation and better pollination. The pruning cuts seen on young trees were also very edifying - look where the central leader has been removed on the tree in the middle. It's healed over, possibly a couple of years past, so I assume this shaping is to encourage production of fruit. Return visits with my membership mean that I can pop back to see how that's working out. There's something very special about seeing this range of varieties and the ways in which the trees are managed. I'd love to know more and hope to find out on one of the Wisley courses. 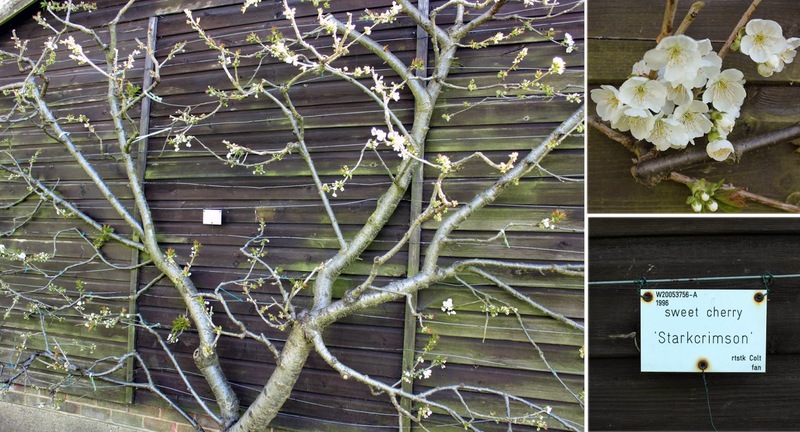 The Summer Fruit Pruning workshop in July looks mighty tempting and I'll definitely be thinning out my plum trees this summer so a boost of knowledge would be put to good use. Onwards to the trained fruit. I do love the look of this, it's just so clever, so neat and tidy. I wish I'd known how to do this with our fruit trees at home. It not only looks beautiful but is productive and perfect for a small growing space or as an edible boundary. (I recall my grandad used espaliered apples to cleverly section off his allotment area from the rest of his 150 ft long garden.) A range of shapes can be seen: pear and cherry trees growing as fans, apples grown as step-overs and cordons against the shed. 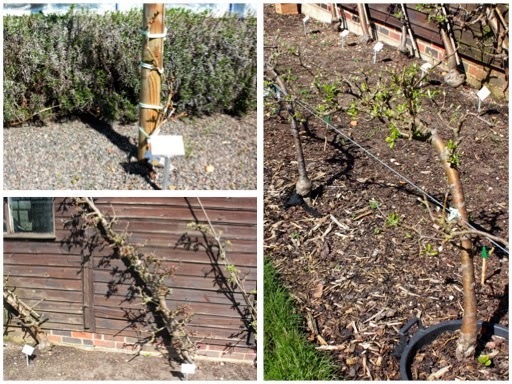 I stopped to photograph the step-overs - making note of the tub that each tree is being grown in and how the length of the main stem has been bent and tied in with pruned spurs left for fruit bearing. I imagine they'll be moved in the future once the trial is finished and illustrates how well a tree will do in a good sized tub (and the right care). I was intrigued by the way grapevines (top left) are being grown, up a column. Where's it going to go when it reaches the top - or will it be stopped? Very interesting, worth following up. It was the same in January when I came across a row of gooseberry standards. Eh? I thought they had to be grown in a low growing goblet shape (so the berries could be accessed without injury). I'll make a point of going back because if this works, this is very good news for growers with little space. I must admit that I've pruned my redcurrant bush as a standard although it hasn't given me more than a small bowlful of fruit yet! There is much to be learned here. Strawberries are spaced far apart; at home, mine are pretty much crammed in as nature would have it. Not that I have an option, space is at a premium here, but I wonder what the benefits are of leaving that much room between plants. Bigger strawberries, do you think? Less slug attack? 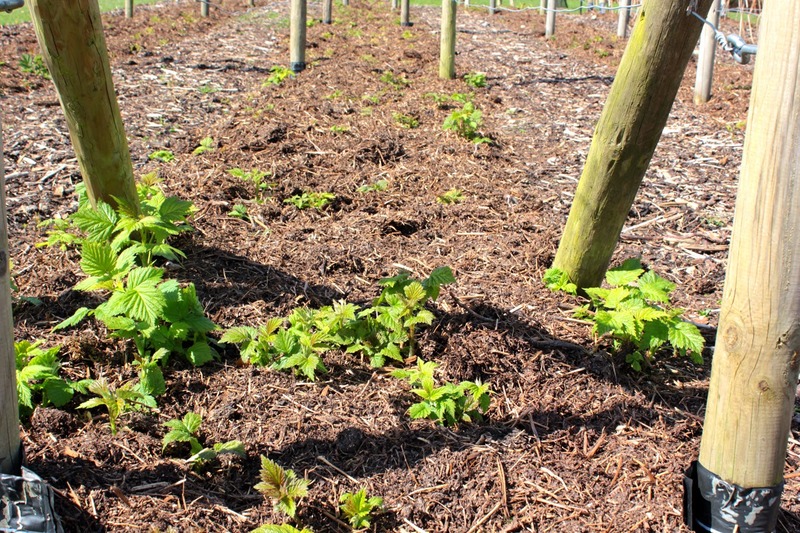 Note the straw mulch over the raspberry beds - a good way to keep the soil moist in hot or windy weather. And these raspberries… In the past I've pulled out all the runners, now I'm thinking I should leave a few as long as they stay within the set boundaries. What do others do, I wonder? But it was the rhubarb trials that were the real eye-opener. Four wide beds with two plants of each cultivar growing on each side. 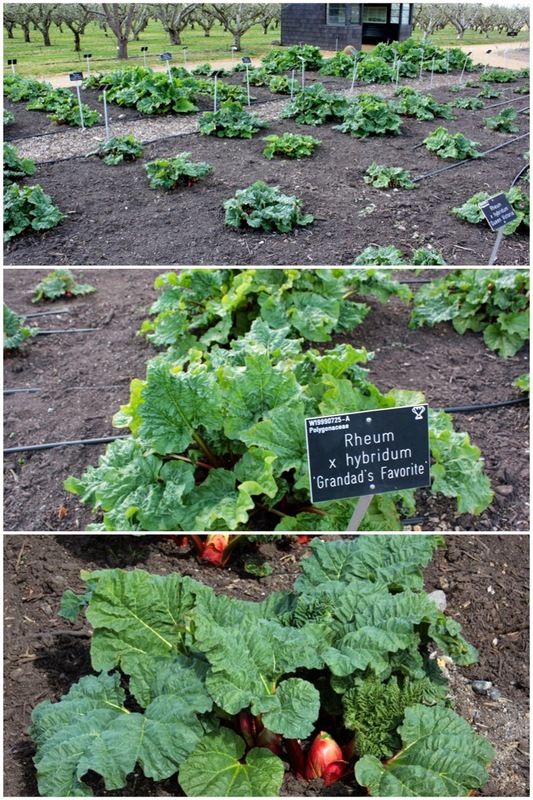 There were over 60 rhubarb varieties growing there! Most I'd never heard of but noted the difference in size - the 'Earlies' were huge while others had barely started to put out leaves; others had much thicker stems and smaller leaves; some had the bulbous centre growth that also heralded the flowering of my rhubarb. Again, worth taking note of any varieties that appeal as rhubarb plants can produce over many years so choosing a monster plant for a small garden may cause regret. Plus, there's far more choice available than the local garden centre would have us believe. But for any gardeners reading this who grow blackcurrants, I'll leave you with this advice from the RHS. 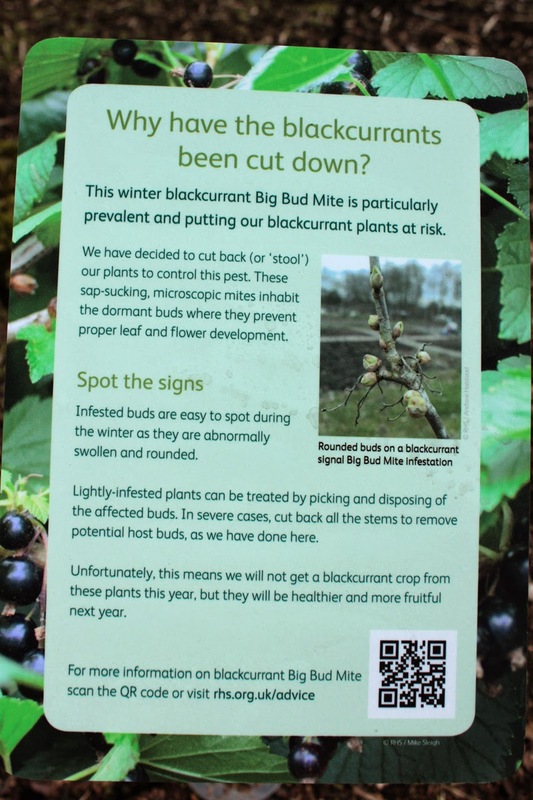 Their bushes have been cut down to try and eradicate Big Bud Mite as indicated by this sign. I don't grow blackcurrants but, if I did, I'd be checking the buds right now. Primula 'Iris Mainwaring', Skimmia, bee on comfrey. 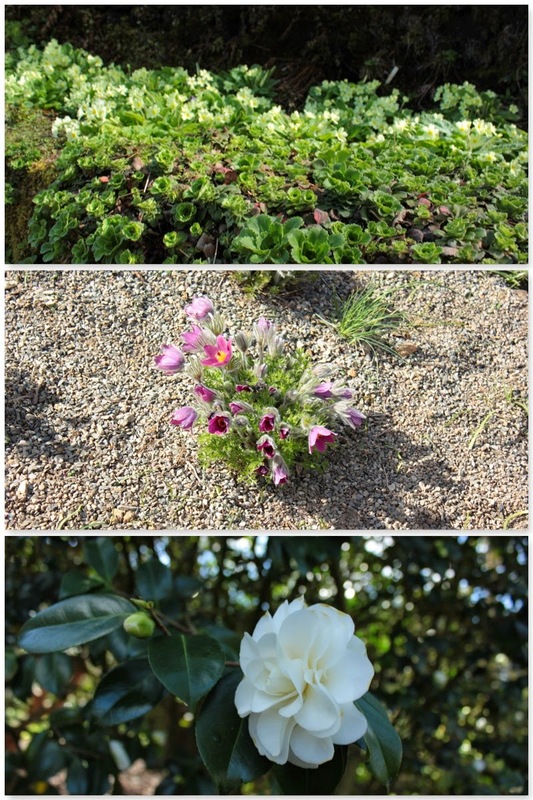 Last weekend I had to return a plant to the nursery at Wisley. I'd bought two identical white Echinacea in mid-January; one grew, the other didn't. No problem, the RHS nurseries guarantee their plants so I was confident of getting a replacement or refund. As a bonus, the sun was shining so the trip also provided a good excuse to use my membership to have a wander round the gardens. There was a Lindt sponsored bunny hunt over the school holidays, an excellent idea to tempt visitors into all areas, with the promise of chocolate at the end. Who could resist? Not I! I collected a form and kept an eye out - even adults like a treasure hunt! It also provided a good framework for my walk, taking me through areas that I explore less frequently like the Glasshouse, Rockery and Children's play area. I had every intention of making this a short-ish visit, a couple of hours max. But that's just silly. 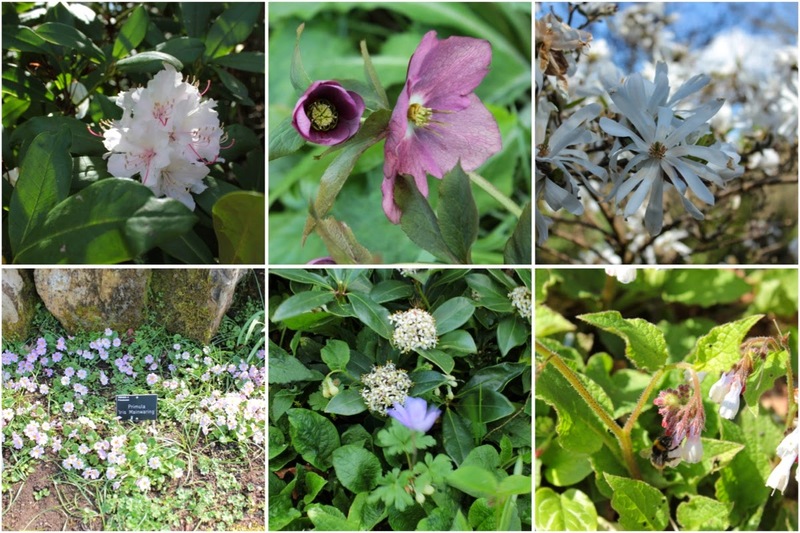 Even at this time of year, I was stopping every few paces to take photos or peer at a label - hence the delay in writing this post, so many photos! 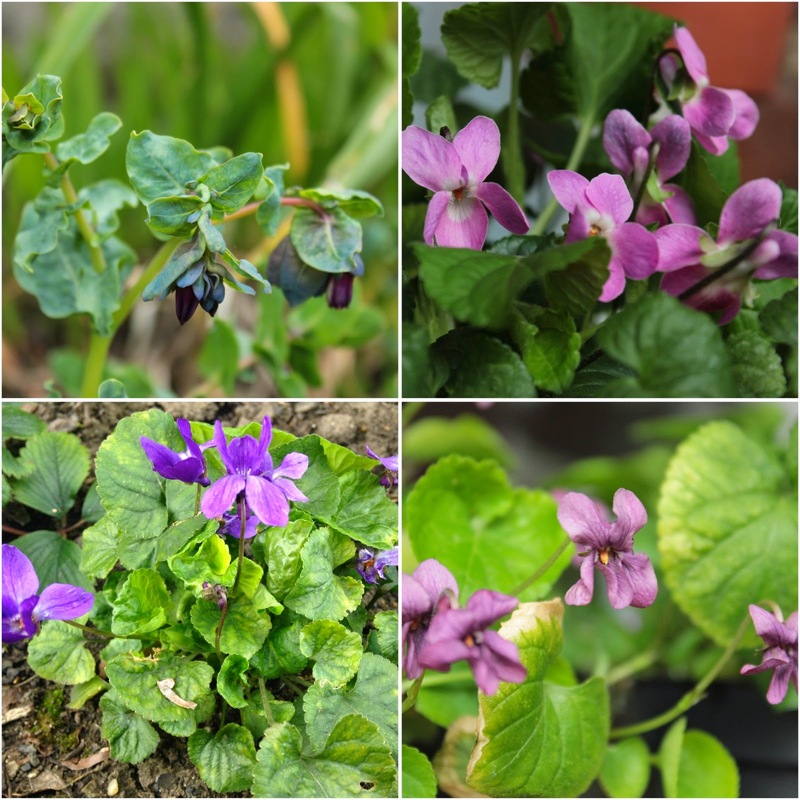 I'd last visited in mid-January in search of scent, winter colour and texture; in the three month interim, most of that has now, as expected, been overtaken by spring planting. People not busy hunting for gold bunnies were busy photographing the magnolias in full bloom - a breathtaking sight on a sunny day. Banks of Skimmia took over where January's Daphne odorata left off, scenting the air all around; white camellias were still looking good while the red camellias were getting a bit, well, past it. 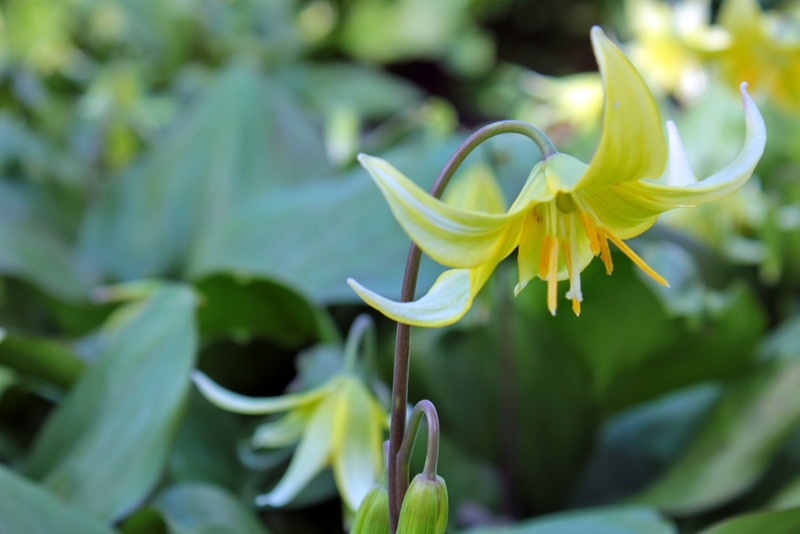 I walked past swathes of Erythronium 'Pagoda' on my way up to the orchard, a small woodland plant I was particularly taken with. Useful and beautiful ground cover is always worth noting. 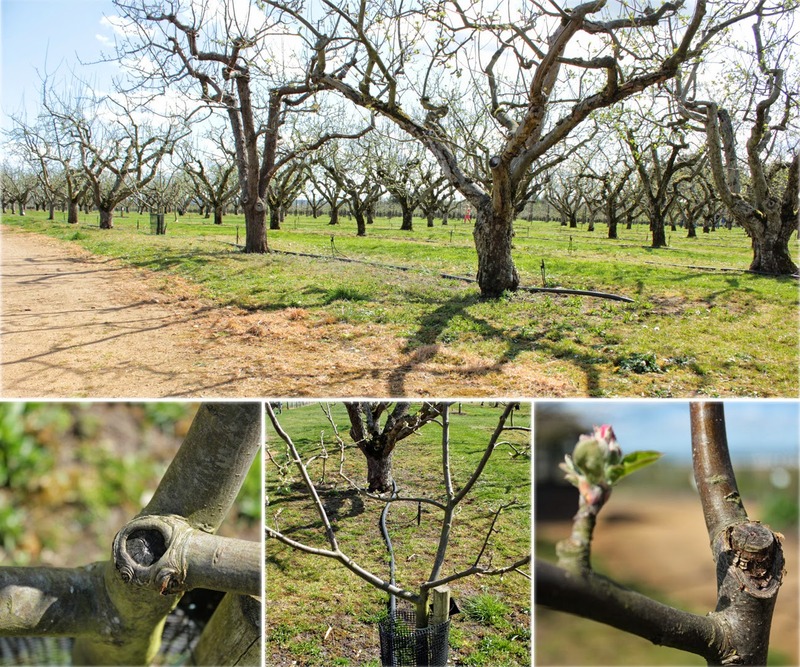 The pruning in the orchard is a lesson in itself which I'll cover in a second post on the soft fruits and edibles growing at Wisley. I always have a look at the trial grounds when I visit, it's so interesting to see the methods that are used and what's growing. The route that I usually walk to get there is via the Glasshouse Borders; as a big fan of Piet Oudolf planting, this is my must-visit part of the gardens. In January the borders were breathtakingly lovely in their midwinter monochrome with the dried seedheads of herbaceous perennials left intact; now those have been cut back as new growth comes through and all is green and fresh, albeit seen at a distance as the borders have been roped off while the grass is reseeded. 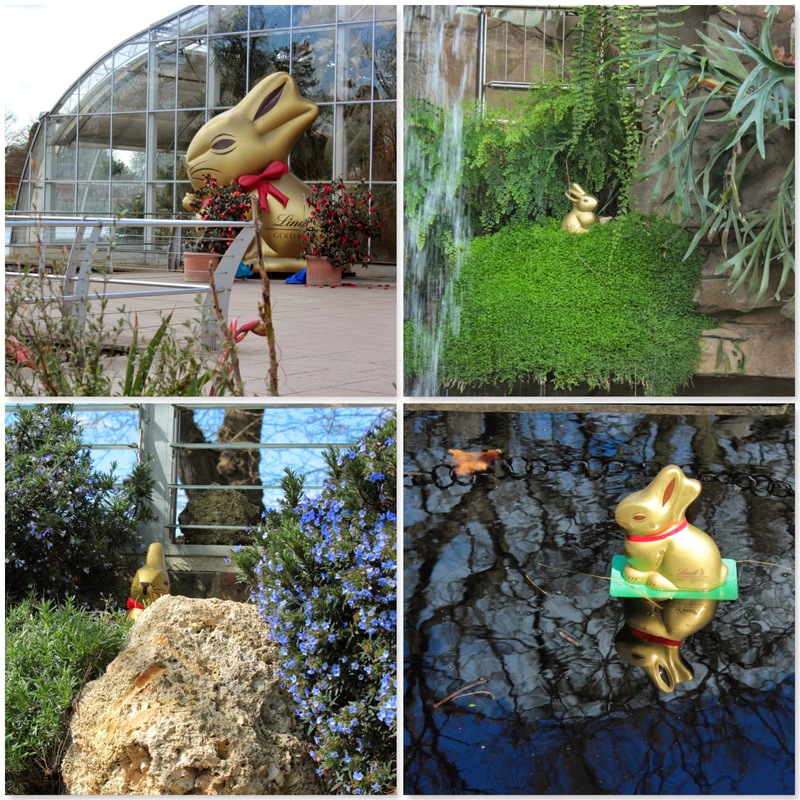 Part of my bunny hunt directed me into the glasshouse. There were two bunnies to be found here but first you had to tear yourself away from the scented air at the entrance! 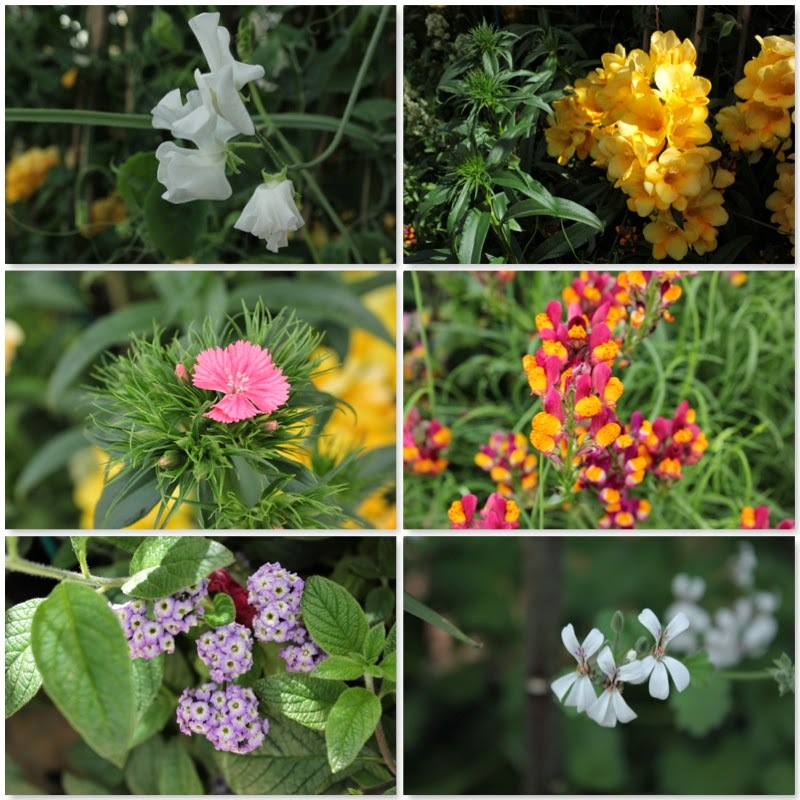 Scented plants had been lavishly arranged around citrus trees - it was an extraordinary treat to smell the gorgeous clove like scent of a dianthus or sweet pea in April! 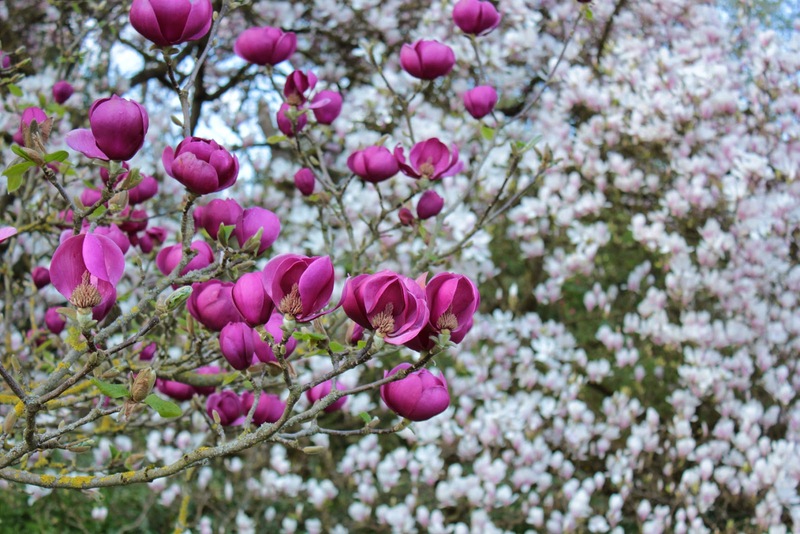 I admit that I hadn't expected the gardens to offer so much of a sensory treat this early in the gardening year but there's always something to take away from a garden visit whatever the time of year. In my case that was literally true as I came away with a haul of useful pollinator plants plus some low maintenance/high visual plants for my mum's garden. More importantly, I found so much inspiration for transitioning 'spring into summer'/'shade into light' planting, no matter what size a garden is - an invaluable resource for a fledgling garden designer. There are heaps more photos which I haven't found room for here so, if interested, have a look at my Flickr slideshow and I strongly recommend a visit soon - I've pencilled my next visit into the diary already. Gardening is a such an education, isn't it? I've been fascinated by bulbous growths erupting from the middle of the rhubarb plants here. It looks like the plant is giving birth as the outer leaves stretch back to reveal the crown of the seed head. Seeing this for the first time, it's been utterly mesmerising. I wish I'd taken one photo a day for the past week. I find the seed heads to be weirdly beautiful, but let's not linger on that thought because this is the rhubarb flowering before setting seed. I found that out only yesterday which left me with two questions: one, Is my rhubarb about to die? two, What causes this to happen? The answers happily are that no death is imminent but the plant is putting energy into producing seed rather than tasty stems. This happens when the plant is stressed and deciding to cut its losses by reproducing itself via seeds. The plant can be stressed by lack of nutrients, lack of water or damage from pests. (That will be number two for me, I think.) Flowering is also more usually seen in mature plants especially where the crown has become congested. I have three rhubarb(s) - one Glaskins' Perpetual grown from seed three years ago and two Red Champagne planted as bare roots last year. (I didn't realise how big they grew and how productive they are. #education.) The Glaskins is planted in a sunny spot, while the Champagnes sit in partial shade. None of them get nearly enough water, particularly in the dry and warm weather we've had recently (don't get me started on the lack of a nearby tap!). Prevention: Enrich the soil around the plant with a few chicken manure pellets, water well and mulch with a good thick layer of compost or well rotted organic matter to prevent the soil from drying out. And by 'thick', I mean a couple of inches of mulch but don't bury the crown as it may rot. Then try and keep the plants well watered from then on. Right. Time for me to go and find a sharp kitchen knife and a large vase. Apparently the stalks last well as a cut flower - bonus! PS. I wish I didn't have to cut the flower stalk because, looking at my top photo, they really are extraordinary stems that probably deserve a place in an edible ornamental garden! We've definitely been spoiled this past week - a bank holiday and good weather. The British climate can sometimes spring us a nice surprise. (Pun intended!) I've even wondered where I left the sun cream. A glance back over my fortnight would show some sorting of plants, a bit of seed sowing and copious amounts of time cobbling together fence barriers around the food garden. Each raised bed was previously protected with 2ft high netting; even so, I spent a good hour cleaning the empty beds of animal poo (again). Whatever these creatures are, they've managed to get through the defences and leave evidence of their visits. Foxes are allegedly partial to eating worms so that's another reason to keep animals off the soil. It was time to devise a new system of defence. Using a metal spike to make holes deep into the clay under my soil, I've bashed 6ft canes into the ground around the perimeter of the food garden and tied 3ft high netting or wire mesh to these. Including the height of the surrounding low wall, that will present a 4ft barrier to jump. Hopefully they won't bother, unless we have particularly athletic cats and foxes around our part of town. All that remains is to find a way of letting gardeners get easy access and I'll be ready for a trial run. Then I can start planting. It will be with some trepidation that I remove the netting from around each bed but, on the plus side, the beds will be much more accessible for weeding and for small fingers to explore and plant. A few of the kids here are keen to help with the garden and even to have a patch of their own. Answering one of their questions during the week, I explained that the people who help in the garden get to share the produce. One of the children immediately volunteered to help with growing strawberries, raspberries and gooseberries. Funny that. Volunteers for carrots and potatoes were thinner on the ground. Ho ho, little do they know! 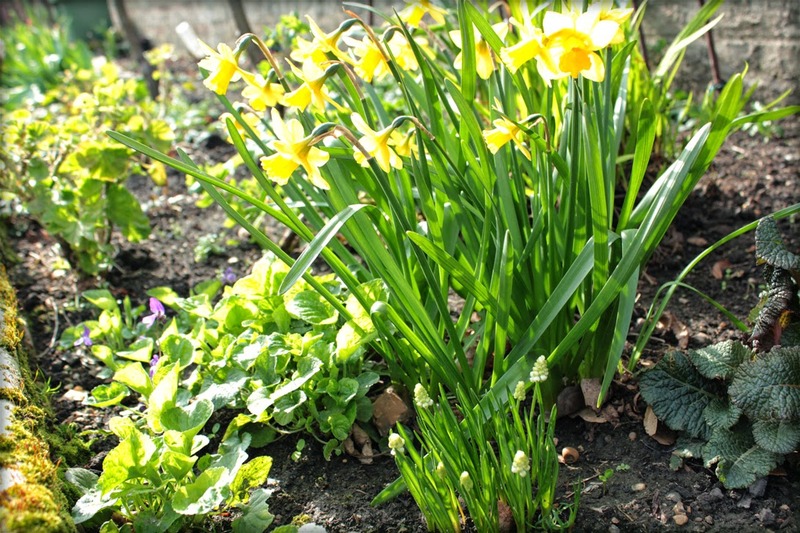 Meanwhile, let's have a look round the garden in early April. 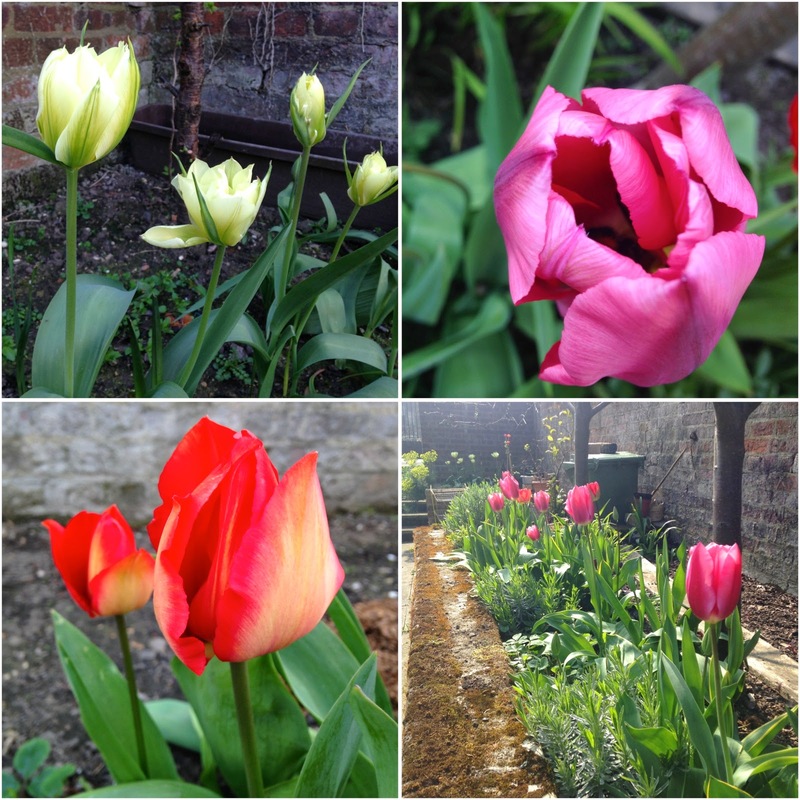 The daffs and cowslips are beginning to fade, the tulips planted Dec 2013 are open again (excellent spend of £5 for 50 supermarket bulbs!) and clumps of muscari, primulas, sweet scented violets and honeywort (Cerinthe) are providing a magnet for passing bees. As is the calabrese blossom left to go to seed. As the blossom is out on the plum trees, with other fruit not far behind, I'm hoping these bees will tarry awhile. 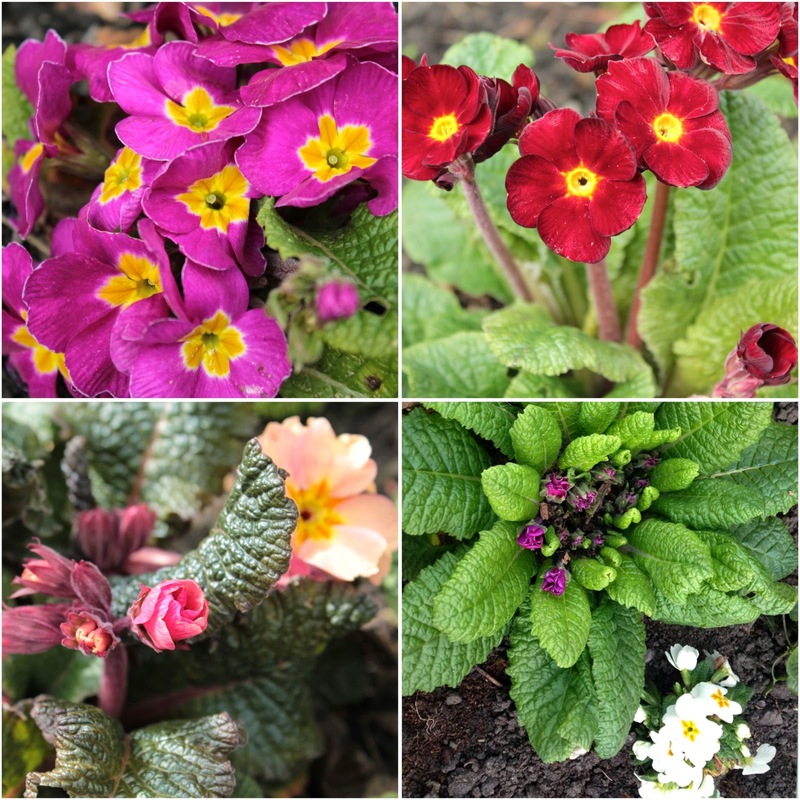 Winter is definitely behind us and this is a good start to spring but let's not forget it could all still go pear shaped despite the warm sunshine of the past few days. 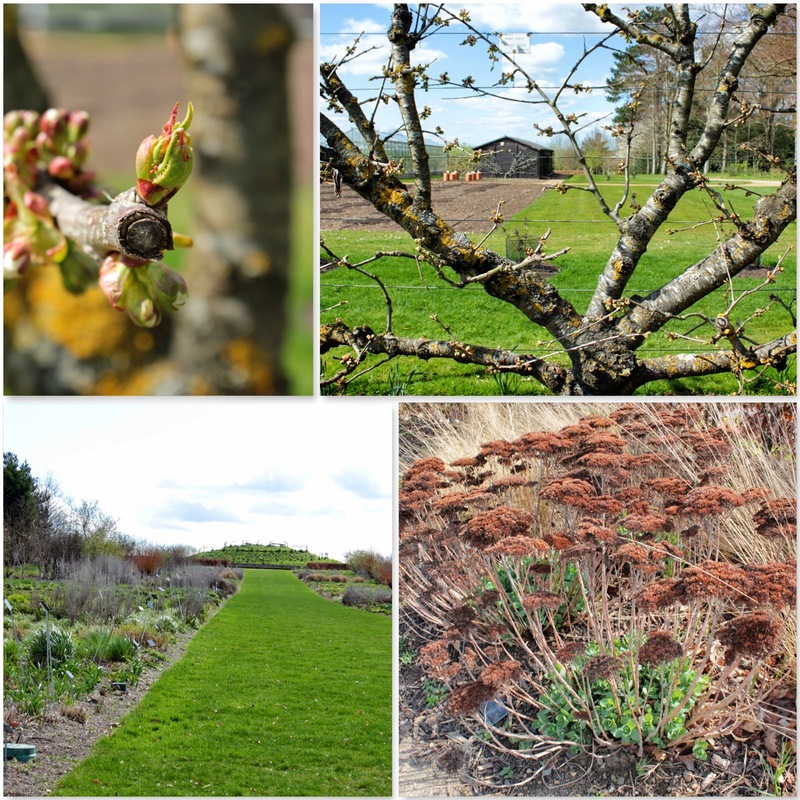 There's lots happening elsewhere in the garden but that will have to be for another post as the sun is shining, the fencing is finished and it's my day off so proper spade and fork gardening beckons! Looking at fencing is a tad dull. Have a bee on calabrese flowers instead. Goodness, my son eats a lot! I'm sure that won't surprise mothers of teenage boys or young men still living at home but, while my son's been away at Uni, it had temporarily slipped my mind how much cooking is entailed during a visit home. And the cost. He's very partial to pizza - usually the expensive shop bought ones - and manages to eat a whole 10" pizza in one sitting while I'm not fussed about pizza at all - it's all that claggy cooked cheese. 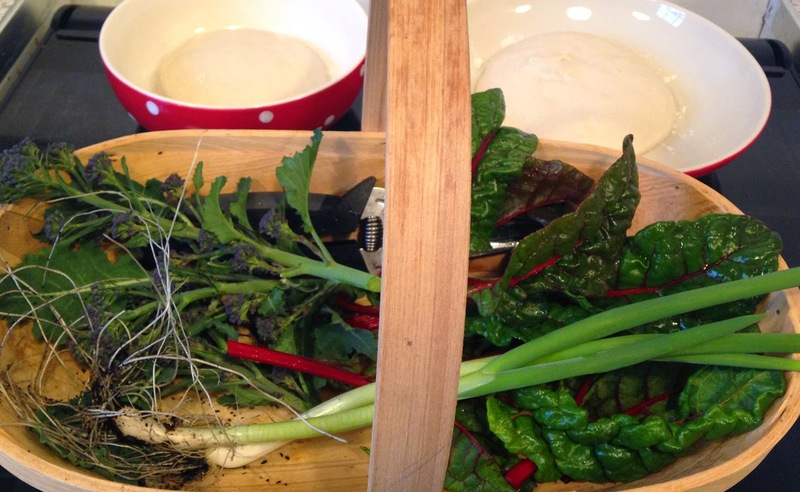 However, talk to me about veg pizza and I might be persuaded - as with a recently discovered recipe. 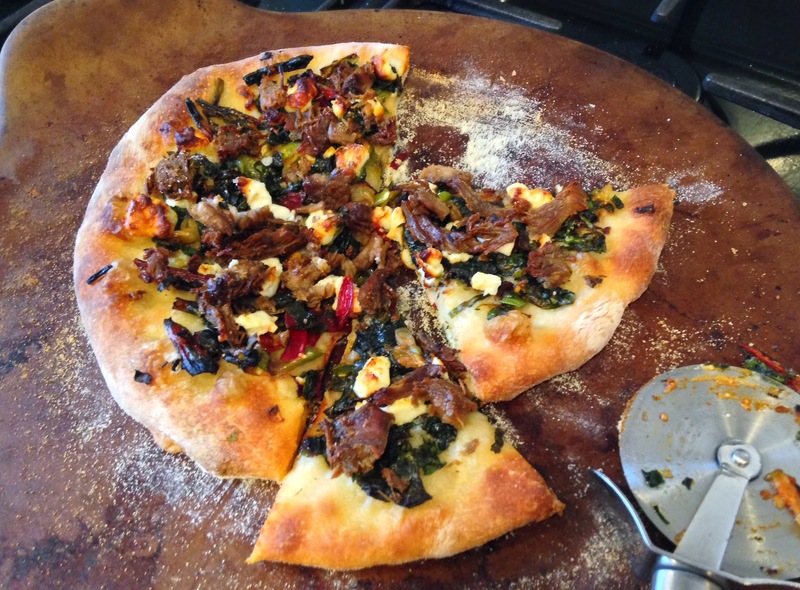 Leafing through a Rachel Allen's 'Everyday Kitchen' for inspiration (it's due back at the library any day now), I came across an appealing recipe for Chard, Feta and Lamb pizza. It caught my attention because, amazingly, I had all the ingredients to hand, either in the fridge or garden. How often does that happen!? (Less shopping time equals more gardening time.) I also had a couple of pizza bases in the freezer, having put some dough aside for these during my last bread making session. I wasn't sure that my son would eat the chard pizza so first made him a tomato/cheese/bacon and mushroom combo before concentrating on making mine. If you fancy having a go at making this pizza, I've written up the recipe as a printable PDF - just click on this link.